How can I exercise my right to an electronic vote? You need a current electronic certificate issued by the Fábrica Nacional de Moneda y Timbre (FNMT-RCM), or an electronic DNI (Spanish National Identity card). Prior to voting, check the conditions of use established in the voting system. The period for voting or the request to vote by proxy was from 00:00 hours on 6 March 2019 until midnight (24:00) on 20 March 2018. In addition you will find technical assistance in the section relating to electronic voting should you have any doubts regarding a request to vote by proxy, electronic voting or information. Submitting the attendance card at the Meeting or a request to vote by proxy revokes the electronic vote. Do not submit this card unless you wish to revoke your vote cast by remote means. 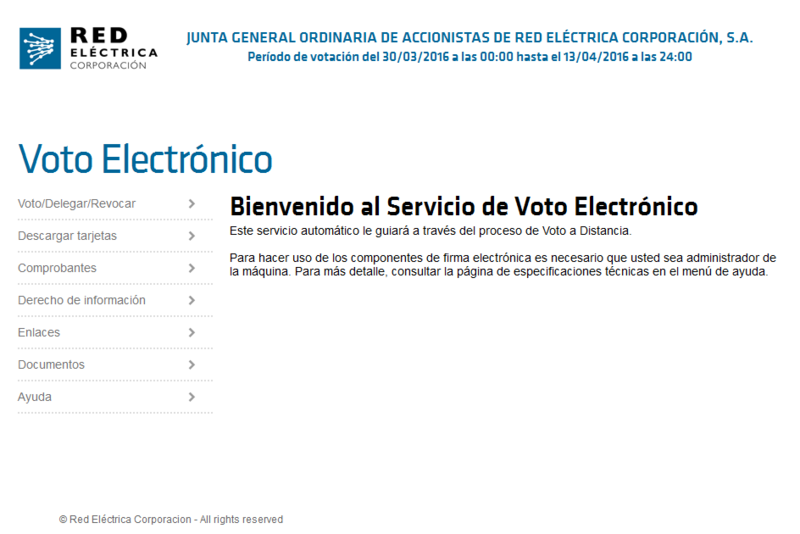 Access the electronic voting system (only available in Spanish). Ceres website for obtain and manage the digital certificates.